Does your fruit basket have bananas which have over ripened or turned black? Regretting why you left them hanging around and did not use them in time? Going to throw them away with a heavy heart? Well then DON’T! 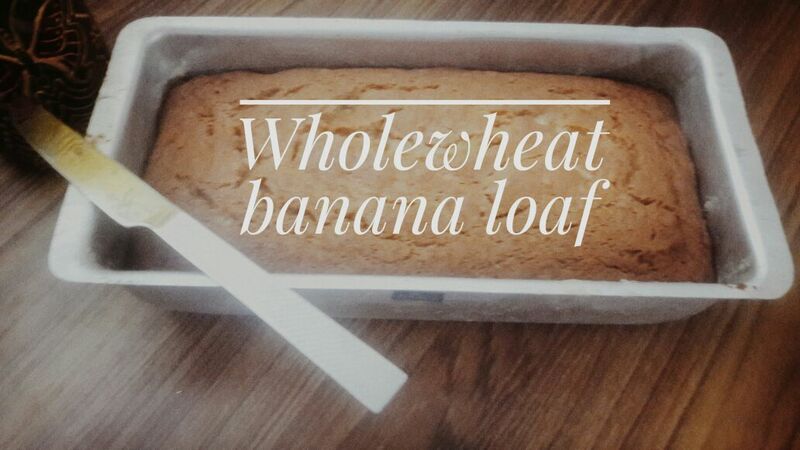 Here I share an amazing recipe Wholewheat banana loaf and i bet the next time u buy bananas u will wait for them to turn black ! It’s an easy and delicious way to use up those leftout ‘ignored’ bananas !! The kids will love the cake as it is moist and intense in flavor. And of-course it is a healthy homemade treat for the little ones who otherwise love to gobble up those unhealthy maida laiden cakes from the bakery. Preheat the oven to 180°C and grease the loaf tin. Sieve the flour and baking soda . Keep aside. Whisk the eggs together, then add the sugar, a little at a time. Beat well. Add oil and beat again. Mix the banana mixture into the flour egg batter and fold everything together until just combined. Do not over mix. Add salt and the vanilla essence. Transfer the banana bread mixture into your greased loaf tin and bake for approximately 30 minutes at 180°C (some ovens might take longer) until golden brown and cooked through(check with a tooth pick and bake for longer if required). Once cooked, remove from the tin and allow it to cool before slicing and serving. Enjoy with ur evening cup of tea/coffee. Eat good and stay healthy! Don’t forget to share this wonderful recipe with your friends. Previous Article Baby Colic and 11 Home Remedies to resolve it. This looks super yummy! Maybe a weekend breakfast or snack! This is great recipe! Thanks for sharing. Yummy. I will make it for my son. Great idea. I always have overripe bananas and this will help a lot. Thanks for sharing ! Great recipe! I use water instead of eggs. I have made homemade banana bread, I usually go for the mix! But good idea with the brown bananas I should try this! Try this recipe…u will never need tht ready mix again! Then u must try this simple recipe asap! !..do share how it turned out. Thanks for the recipe Vidhi. It’s quick n easy n m sure wil be liked by kids n adults. Yes it will b loved by all Divya. Thanks for liking my recipe. This is such a healthy recipe. I’m going to try it for my children. Do u think I can replace sugar with jaggery? Thanks for liking the recipe Hina..There would be a difference in texture of the cake. Some jaggery tend to be a bit sticky. Try replacing sugar with jaggery that is dry. Grate it and add. Should work well!.. I too will try it soon! I am mother of two and this will be quite helpful. I love the fact that I can now use those poor bananas can be used. Thanks for appreciating Mia. Do share how the cake turned out. I wish to eat this always. So good.